Today’s piece uses my own words to present some images regarding American musician and songwriter Jimi Hendrix. Just like William Carlos Williams meditation on a small plant last time, I pretty much follow the famous Imagist rules: direct treatment of the thing, no unnecessary words, and musical phrasing instead of mechanical metrical feet. He had only to keep himself alive, which would kill him. Now, for children who did not know they were children. Walking on squatters’ land, not forgetting to bring their chains. Jimi Hendrix plays for hippies in 1967. Do you envy them or feel superior to them? In the first stanza, I remind us that Jimi Hendrix was a consummate showman, and that he used showmanship to wrest attention for his art, specifically when he appeared at his first significant concert as a bandleader at the famous Monterey Pop Festival and burned a guitar at the conclusion of a flamboyant act. I present this performance as being consistent to Hendrix’s commitment to his art, as a rock’n’roll musician, an itinerant life with associated dangers, which in his case lead to short life and career. Worth it? Necessary for success? Hendrix ends his first American show as a bandleader with a sacrifice to his art. The next stanza acclaims Hendrix for expanding the vocabulary of the electric guitar, using an image of the six-string guitar fretboard, which he transcended with notes beyond the temperament of the frets and though the use of feedback where the notes from the amplifier speaker reflect back to the guitar in the musician’s hands producing sustaining overtones that can be difficult to control but produce extraordinary effects. The question here: these sounds can be harsh, discordant, even painful, but do they too have a necessity? Next stanza: this feedback is presented as Hendrix’s ancestry: part indigenous, native-American; part Afro-American, a descendent of slaves. This makes Hendrix the point where two arcs of American heritage cross: those that were brought to American against their will, like as to livestock; and those that that were already here and were supplanted by brutal or conniving invaders. The questions here should ask themselves, don’t you think? The final lines move from Hendrix, to his audience while he was alive and performing: largely white, largely young, many taking a hippie bohemian voyage I liken to America’s famous immigrants, choosing to leave the world of their homes for some promised new world that cannot, and will not, be exactly as promised. 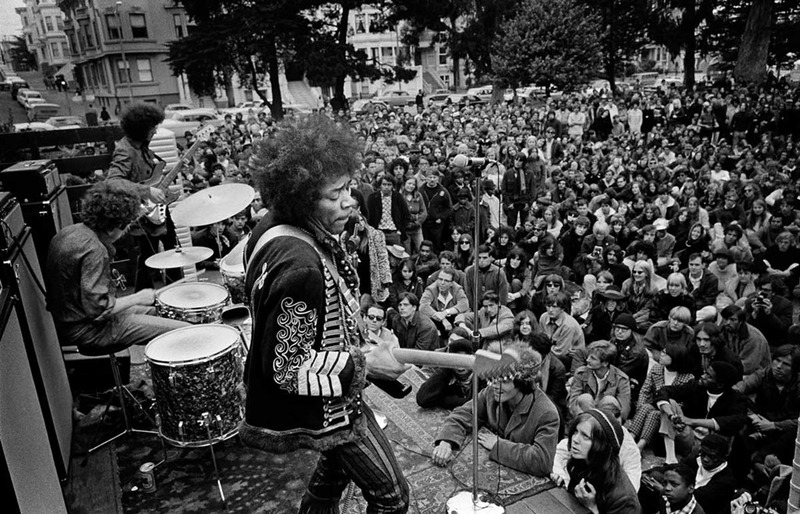 Whatever generation you reside in, you cannot get on a boat or plane to visit another generation’s time; but when you look at a picture or video of a crowd watching Hendrix play, consider those faces. They may be distracted by the day, transfixed or stunned, ignorant and seeking, intoxicated but intent, pleased and puzzled—they may not look like Hendrix, many will seem by their faces to not share his heritage, and none can know the depth of that heritage—and yet, they are dealing with the experience of his art. I ask you not to feel superior or inferior to them from the position of your age or the accident of your generation, but to instead to look to your own heart and ask if there you find some blindness or power, and then to ask, as the concluding words of “For the American Hendrix” does: when coming to your new land, did you carry with you chains? 47 years ago today, Jimi Hendrix died, perhaps alone, perhaps ignored by his companion of itinerant convenience, trying to continue his art, ignorant of the strength of European sleeping pills. To hear my performance of “For the American Hendrix,” use the player below. Thanks much! Since I work more or less full-time hours finding words to use here; and then composing and recording music I use with the words, often playing most (or even all) of the instruments, it’s been folks like yourself who have helped get the word out about this work. You sound like my hero Emitt Rhodes! Do you know that name? As a former devote of cutout record bins and used record stores, I know Rhodes from that classic under-appreciated by the market LP with the burnt-out building cover. Your comparison is very flattering, but Rhodes has a much better singing voice that I do, thus the talk-sing thing I need to rely on. For me playing all the instruments is a necessary production shortcut. There are band-based recordings here (many “live”), and I would do more if I could. Particularly in the pieces with the string parts, I need to play/record them line by line, so there I’d need to clone myself to play them with a live band.